Certified integrative nutritionist and fitness instructor Dora Vandekamp, founder of the blog Biohack Your Beauty, offers this recipe for an anti-aging cream that will leave your face hydrated and silky smooth. You can find these items in your local craft stores, Walmart, Target, and Amazon. Add jojoba oil, coconut oil, beeswax, and cocoa butter to your Instant Pot. Select "Keep Warm" on the settings panel and allow ingredients to slowly melt — around 20 minutes. Add Frankincense essential oil then spoon into a Mason jar. It's best if used within six months. 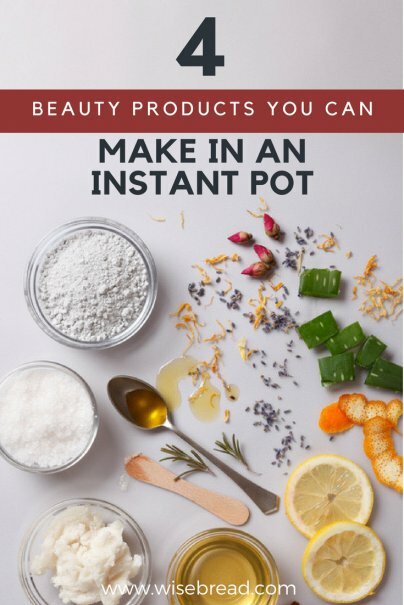 The most abundant Instant Pot beauty recipes online are currently for hard lotion bars, which offer the concentrated moisturizing effects of traditional lotion without all the mess. They also make pretty neat gifts. Lindsey Dietz at the blog Traditional Cooking School by Gnowfglins walks you through the process, from grating main ingredients cacao butter and beeswax, to melting everything down in the Instant Pot with essential oils, to filling a silicone mold with the mixture and letting it harden. Dietz recommends for added scent, you select a "skin-nourishing oil, such as ylang-ylang, cypress, lavender, sandalwood, or frankincense." For the silicone mold, you can find fun shapes at your local craft store or Amazon. This is an easy project that doubles as self-care. I consider myself a Burt's Bees loyalist when it comes to balms and salves, but I gave this recipe for Instant Pot herbal hand salve a try, and I may never go back. Great for keeping your hands and feet from cracking in the dry winter months, the salve recipe from Natural Beauty Blog by AJ's starts with making a soothing antibacterial oil with lavender buds and jojoba or sweet almond oils. Once that's complete, you combine the oil plus grated beeswax into the Instant Pot, stir until melted, and add a few drops of your favorite essential oil before pouring into pocket-size Mason jars or tins. Chris at Joybilee Farm uses her Instant Pot to make herbal soap with the stainless steel insert because it's nonreactive and suitable for this type of project. The soap recipe she uses includes multiple oils, cold water, lye solution, essential oils, and frozen milk. "The insert can be used for melting fats and blending oils," she says. "It can be used to stir the lye into the fats and bring the soap to trace. It can also be used to cook the soap after trace, speeding up the time it takes for the soap to cure." Chris also notes that "nonreactive glass should be used to hold the lye solution whether the soap is made with herbal tea, milk, or water," and should never be held in a metal container. Soap-making can be a lengthy process, and it's important to use caution when going through the stages with extremely hot liquid, and multiple chemicals. Wear gloves and eye protection to be safe.